Click on the image to open a large version in a new window. Click again to further enlarge. 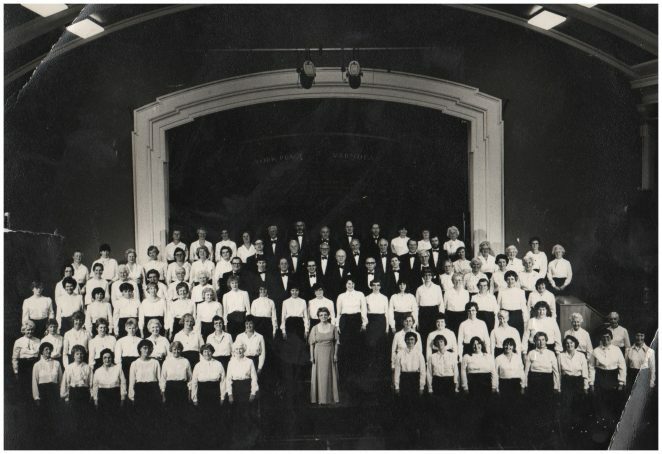 This photograph was taken sometime in the late 1980s and would have been taken at one of our many concerts.The Brighton Orpheus Choir at that time was conducted by Patricia Harding who was also the senior music teacher at Varndean Girls. I am in the front row – 3rd from centre; the lady standing next to me – 4th from centre, is my best friend, Jane Maxwell. She and I were at Stanford Road Juniors, then at Varndean together and have remained friends ever since. The Choir used to put on three events a year, two with a full orchestra and soloists, and we were always sold out. Do you recognise yourself or anyone else here. If you can share your memories with us, please leave a comment below. Mrs Harding was my enthusiastic music/singing teacher while I was at Varndean, and my fifth year form teacher in 1971/2. She was a nice lady and very dedicated. It was thanks to her that we had a very good school orchestra. I remember going in to assembly to the rousing strains of “Procession of the Sardar”! It was nice to see her face again. Third and fourth from the centre. Which side? Did you know Mrs Harding was awarded an MBE and had a Brighton bus named after her?I tried to cut and paste but can’t manage it on this device however both can be found by googling Patricia Harding MBE. Hi Stefan, Jane and I sang alto, so right side as you look at it but the left of the choir if you were in it. I remember Mrs Harding from Varndean 49-55. Her husband was a cellist and often conducted the school orchestra. They were a wonderful couple. I was at Varndean for A levels and one of the tasks undertaken by the physics’ students was to do the lighting for Orpheus choir concerts. One night the guest soloists included a young Stephen Varcoe, before he was much more widely known but he rather stood out as a talent. Third row (from front), fifth from the viewers right , my mother, Patricia ‘Trish’ Barrowcliff. I will ask her to put some names to faces when I show her this photo. I was a student at Varndean Grammar School for Girls from 1963 until 1970 – Patricia Harding was a real inspiration. I learnt to play the oboe, and such was the enthusiasm and dedication by Mrs Harding, I graduated to the Royal Academy of Music (along with 2 others in my year), and became a freelance oboist and teacher. Pat Harding was an inspirational music teacher while I was at Varndean 1956-1963. Thanks to her I read music at Cardiff University and have spent my career in school music teaching. I remember the Orpheus choir was in the gallery choir for St Nicholas! Ruth Bardou (nee Soward ).